​I've been playing my Retro-Revial "Crescent" mouthpiece for just over a month now, and really enjoying the sound I've been getting from this great mouthpiece. It was therefore a real pleasure to receive two more Retro-Revival pieces to review from Jazz Views Music, the "Super D" Replica Vintage Link Double Ring Super Tonemaster "New York" for tenor saxophone, and the "Seventh Ave. South" Replica Guardala MB II which was originally made by Dave Guardala for the late Michael Brecker. Both mouthpieces are a joy to play, and yet have very different characteristics and tonal qualities, as I soon discovered. The "Super D" Replica Vintage Link Double Ring Super Tonemaster is an exact replica of the much sort after early 1950's Otto Link “Double Band ” Super Tone Master mouthpiece, once favoured by such luminaries as Eddie "Lockjaw" Davis, Dexter Gordon and Johnny Griffin. This particular mouthpiece is offered in tip sizes from 6* to *8 and in two different finishes, the rhodium plated "Florida" with a high baffle giving a bright edge to the sound, and the gold plated "New York" which has a lower baffle and a darker sound. The mouthpiece is beautifully made with the table, rails and tip are immaculately constructed, and even. The model received for review is the "New York" 8 with a tip opening of .110, and comes in a cardboard tube instead of the more traditional box. Inside the mouthpiece comes in its own cloth drawstring bag and a Rico "H" style ligature. I tried the mouthpiece with a Lupifaro Jazz #2.5 reed, and straight away I noticed this piece is much darker than the "Crescent" and is easily the darkest that I've tried in a while. Like all the retro revival pieces I have tried, it again is free blowing with a nice fat tone from low B♭ right through to the altissimo. The tuning on the entire range of the horn was spot on producing a deep, full and round tone. The response from the mouthpiece was immediate and I felt that should it be required that the piece would take a lot of air. By the same token, I also found that it also plays at a whisper, and easy to produce subtones. So whether playing a set of ballads, or tearing it up a little the control was just where I wanted it. 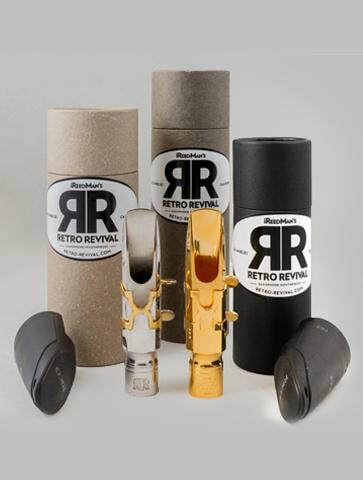 Once again, Retro-Revival have taken the best from the classic mouthpiece of the past, and with much research and the use of modern technology produced a mouthpiece that eradicates the shortcomings found in the vintage pieces without losing their integrity. As well as the "Super D", I also received a "Seventh Avenue South" tenor saxophone mouthpiece, made by Retro-Revival from Jazz Views Music. The "Seventh Avenue South" is a copy of the mouthpiece used by the late, great Michael Brecker, that was made for him by Dave Guardala. This new model is a Precision Hand & CAD Copy of Retro-Revival's Joel Peskin's own personal MBII that Dave Guardala hand made for him when he first started his operation. The "Seventh Ave South" is offered in two different tip openings, .116 and .107 which is the model I have played for this review. It comes in Retro-Revival's distinctive cardboard tube, a cloth drawstring bag and a Rover Star Series Ligature and Rovner Cap. I tried this with the Lupifaro Jazz two and a half reeds and the Rovner ligature which secured the reed nicely in place. There should be a health warning with this mouthpiece as it will take the wallpaper off the walls! It blows full from top to bottom with superb altissimo and a big fat low B-flat. Once again, the tuning is spot on, with no problems from low B♭ right through to the altissimo register. While the "Seventh Ave South" has plenty of power, it plays well at a more subdued volume producing a very warm sound. I found the .107 very easy blowing and look forward to trying it with slightly harder reeds. If you are looking for a modern contemporary Brecker sound and this really should be something that you should consider.